Two words describe the running scene in the Tampa-St. Petersburg area: weather and water. 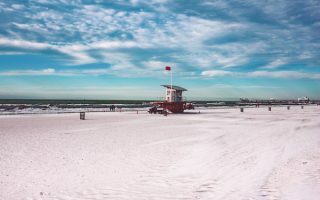 The running culture is upbeat and varied, and there nice options for urban routes taking advantage of Tampa Bay and local beaches. 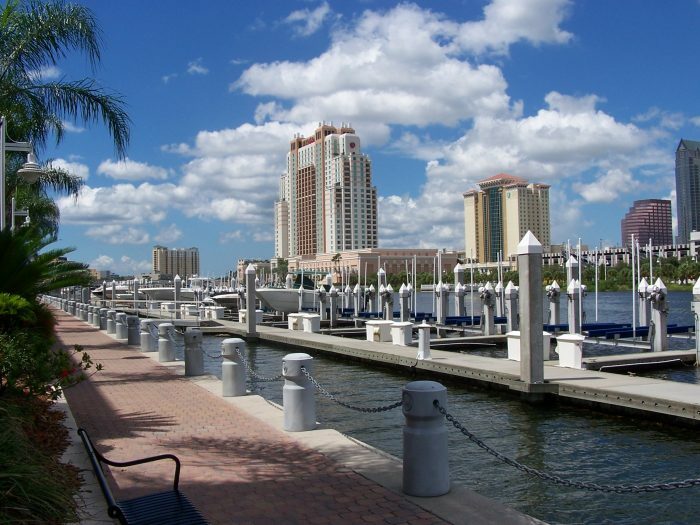 This is our guide to running in Tampa-St. Petersburg and Clearwater. 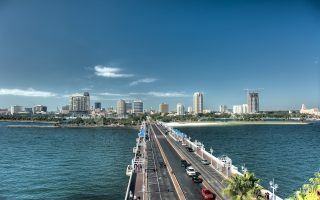 Among the best places to run in Tampa-St. Petersburg and Clearwater are in downtown Tampa along the Bayshore Linear Park Trail — a scenic 4.5 mile long sidewalk along the waterfront. 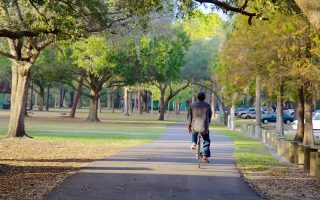 A little further from downtown, accessible by car, there are some pleasant parks for running, enjoying Florida’s flora and fauna. 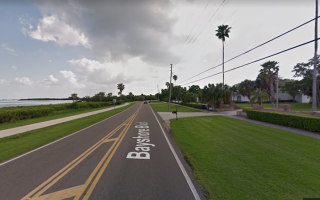 In St. Petersburg, the three best options are wonderful routes near downtown, such as the North Bay trail out to Snell Isle, runs along the beach, and south to Desoto Island. It’s about 10 miles from downtown St. Pete to the beach. 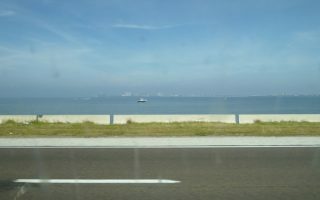 We also include several routes in Clearwater, just to the north of St. Pete. We love running on Clearwater Beach, on the lovely waterfront trail along N. Bayshore Dr. to Safety Harbor, and on the Ream Wilson Trail linear park. The weather in this area is great — sunny nearly every day. June through September can be uncomfortable hot. Be aware of summer heat and near daily thunderstorms. Claimed to be the world’s longest continuous sidewalk, stretching 4.5 miles along the waterfront. Spectacular views of the Bay and the downtown skyline. The route features water fountains, and fitness stations, and mile markers. A lovely 3.5 mile run along the Seddon Channel, just south of Tampa General Hospital, and near the Bayshore trail. Run for 3.5 miles to the end at Davis Islands Yacht Club, using the several bridges that connect the islands. A long, flat run with great water views. 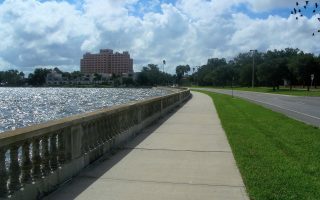 The Causeway runs for 8.5 miles from Ben T. Davis Beach to the other end of the bridge in Clearwater. There is a separate pedestrian path, well away from cars in sections. A centrally located 100+ acre green park with ponds. There are a couple of marked loops, with shaded paths. Site of popular 5k races. Recently renovated and expanded, the Riverwalk offers spectacular views of the waterfront and downtown. 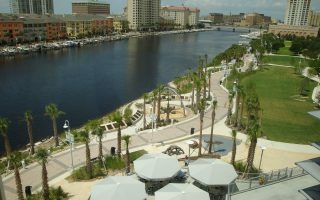 1.4 mile trail, with 3.5 mile loop option crossing the river to the University of Tampa. A scenic paved trail with more of an urban feel stretches 7 miles from Memorial Highway/Montague Street at south to ending at Peterson Road Park at north. Good option near the airport. 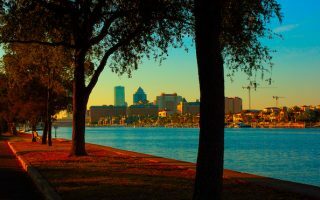 A beautiful natural park located 20 miles northwest of downtown Tampa featuring 2.2 mile off-road trail on varying terrain circling around Lake Rogers, with mile markers. Great 8-mile loop with wonderful views of Tampa Bay. The Snell Isle section features attractive mansions and waterfront homes, and the return loop includes the historic neighborhoods of St. Pete. Several miles of trails, including 2+ miles of boardwalk, at this 3,190-acre natural preserve. Lots of interesting plants and wildlife, great marsh and bay views. Good off-road running opportunity only a few miles north of St. Petersburg. A great beach run with spectacular views of the Gulf of Mexico and gorgeous sunsets. 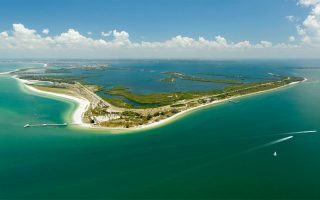 The southern end of the beach tends to be more tranquil, with nice views to Shell Key Preserve. 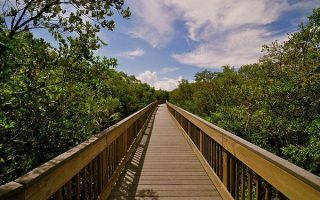 A beautiful park with Florida vegetation and marshes located on the islands lying at the mouth of Tampa Bay, 7 miles south of downtown St. Pete. 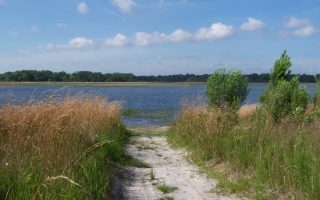 Popular place for running, with paved roads and recreational trails. Very nice running between Gulf to Bay Blvd. (Rt. 60) and Safety Harbor Marina along the Ream Wilson Trail on the west side of Tampa Bay. 3 miles to Safety Harbor with nice water views. Extend for 2 more miles to Phillippe Park. A lovely run through a linear park along the Ream Wilson Trail. Take the west branch of the trail off N. Bayshore Blvd. 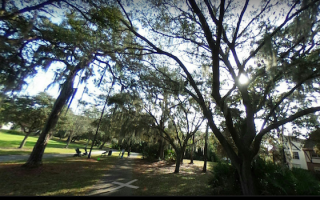 It's a 4 mile loop out to Kapok Park, and a 7 mile loop to Coachman Ridge Park. Very pleasant! Popular and attractive beach that's great for running. Wide beach is nearly 6 miles, and includes a 1 mile section of beachside path & 1,000 foot pier Pier 60. 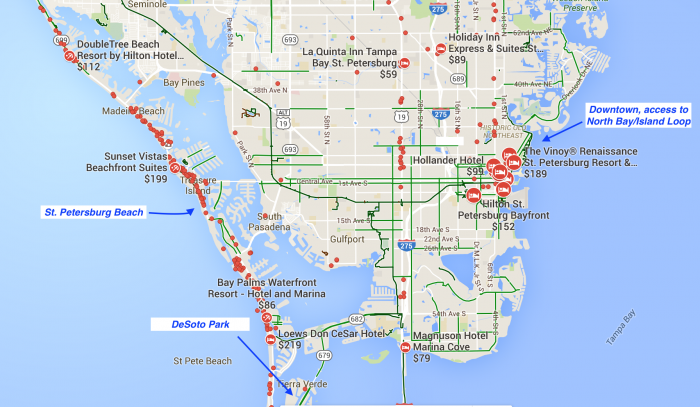 A great paved option is 6 miles out and back from Pier 60 Park to Sand Key Park. 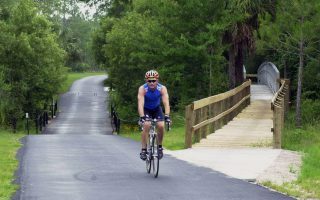 A 50+ mile rail trail between St. Petersburg, Clearwater, and Tarpon Springs. Provides a good off-road opportunity for running. We've included a map, charts with segment distances, and pointers on the nicest sections. 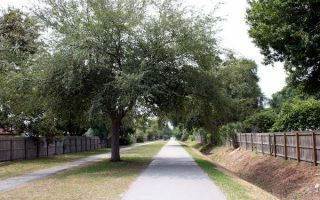 A group of parks connected by trails and located 20 miles northeast from Tampa downtown. 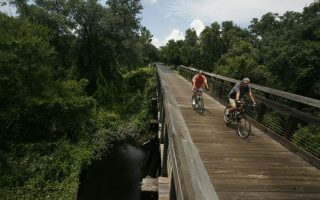 A highlight is the 7-mile Flatwoods Park multi-use Trail, as well as off-road trails. It’s Florida. Temperatures are warm to hot and quite from mid-May to mid-October with frequent thunderstorms. But it is sunny nearly every day. The Tampa area has a reputation of being the lightning capital of the U.S. 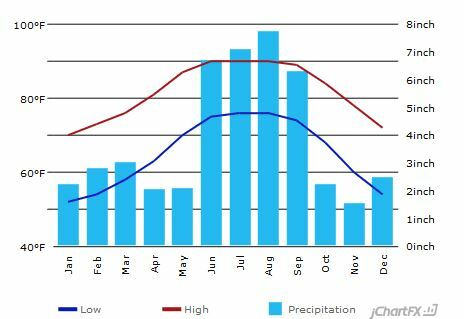 It receives an average of 26.1 inches of rain from June to September but only 18.6 inches during the remaining eight months of the year. In the winter, average day temperatures range from the low to mid 70s °F during the day but there are occasional cold snaps in the winter with temps in the 40s-50s. 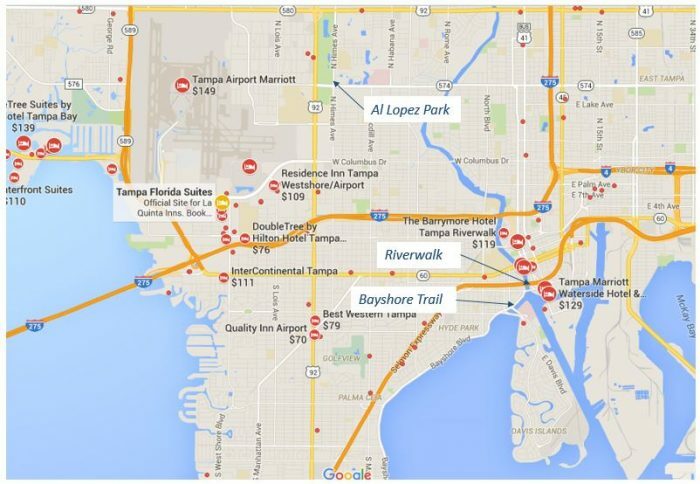 Ideally, try to stay downtown, where there is a large selection of hotels with good access to the Riverwalk and Bayshore trails. Tampa is spread-out, so some of the other running routes are located outside the downtown core. The airport hotels offer some access to some park trails such as Al Lopez Park. 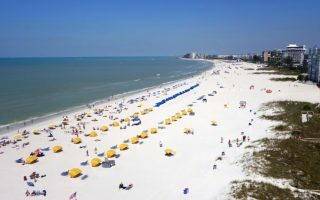 For St. Petersburg, the two hotel clusters are downtown, with access to all sorts of runs including the North Bay trail; and in the beach area, with access to beach side trails and the jaunt down to DeSoto island. It’s about 10 miles from downtown St. Pete to the beach. Running Center. Great local running specialty store established in 1999. One location north of Tampa downtown. The store prides itself on it’s skillful gait analysis and customer service. Has collected over 1000 pairs of reusable running shoes for the homeless in the area. Feet First. Another great running specialty store with over 30 years’ heritage. Good selection of shoes, apparel and gear, knowledgeable staff. Located just a few blocks from the Bayshore Linear Park Trail in Tampa. Additional location in St. Petersburg, slightly north of downtown. Fit2Run. 2006 established family-owned running specialty chain with 16 retail outlets in Florida. Tampa store located near International Airport and features a fitness bar for healthy nutrition. St. Petersburg location is right downtown near the trails. Offers video-taped gait analysis, good selection of products and weekly group runs. New Balance. Two locations in Tampa, one near the International Airport and the other ~10 north from downtown. Run Tampa. Running club for people of all speeds, founded by a veteran running coach in 2008. Arranges several group runs each week in various places and offers coaching services, too. Individual memberships are $25 per year. Tampa Bay Runners. 30 year old social running club arranges events and weekly group runs. On Wednesdays, group runs in Carroll wood at the Walgreen’s (Dale Mabry/Fletcher) at 7pm and on Thursdays, group run at Temple Terrace Elementary School at 7pm (124 Flotto Ave). Arranges the annual Strawberry Classic to benefit the Pediatric Cancer Foundation. Individual memberships are $15 per year. St. Pete Road Runners (SPRR). A several hundred member running club started in 2006 when five area women wanted set up a club for individuals of all ages and abilities. Group runs seven days a week in various locations, see list here. Annual memberships are $20 for individuals and $5 for students. Four Green Fields Running Club. A slogan “A Bunch of Drinkers with a Running Problem” tells it all about a bit lighter approach that this club has to running. 5k group runs from Four Green Field patio (205 W. Platt Street) every Tuesday at 6pm. Cold pints afterwards for hydration, obviously. One-time $5 fee to join the club. Gasparilla Distance Classic, named after Gasparilla Pirate Festival, is the largest running event in the area with over 30,000 participants. It is run on Bayshore Boulevard in late February or early March each year and it features various distances from 5K to a half marathon. Tampa Bay Times Turkey Trot. Takes place on Thanksgiving Day and features 1K, 5K and 10K. Proceeds from the event help support many local charities. Great way to prepare for turkey eating overload. Gobble gobble. Best Damn Race. Running series created for runners by runners. Runners of levels welcome, features 5K, 10K and half marathon. St. Pete Beach Classic. Claims to be “the only race that lets you relax before, between, and after your races”. Taking place in St. Petersburg in January and features 5K, 10K and half marathon, plus a Beach Fun Run.